By month’s end, Gameloft will be bringing Asphalt 4: Elite Racing to the iTunes App Store. 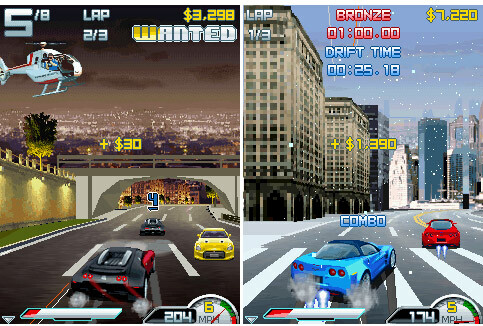 This accelerometer-based racing title is an iPhone-enhanced port of the publisher’s original mobile phone version of the game. Pocket Gamer recently had the opportunity to take the iPhone version for a quick test drive. Time was of the essence when we buckled up for our test drive of the game. The short race we played had us zipping in a blue Mini Cooper through the streets of Los Angeles, speeding toward the finish line in hopes of seizing first place. Any competitors in our way were unceremoniously taken off the road with a bash from behind or swipe from the side. The takedown mechanic is one of the few distinctive features of the series that returns in Asphalt 4 and it’s more satisfying than ever. Enhanced graphics obviously make take downs visually more appealing, but it’s a greater sense of destruction accompanying each take down that really ups the crash factor. The accelerometer control in Asphalt 4 is as one might expect: a forward tilt accelerates, a down tilt brakes, and side-to-side motion controls steering. Speed boost can be achieved with a quick forward jerk of the iPhone. According to Pocket Gamer, the control sensitivity is excellent and the iPhone’s controls make drifting (a critical component of the game) much easier than in the mobile version. Another nice feature of the iPhone version is support for both portrait and landscape play, with on-the-fly switching fully supported. We will provide a review of Asphalt 4 along with gameplay footage upon its release.